I participated in "Make Me Read It" last year, and honestly, this year I wasn't going to participate because with my summer program, I wasn't sure how much time I would have to actually get a lot of reading done. But, I have decided to give it a go anyway. It's towards the end of the program and I feel like it is a good motivator to get me back into the swing of things before I go back home. So without further ado, below are the details of the readathon and the voting. 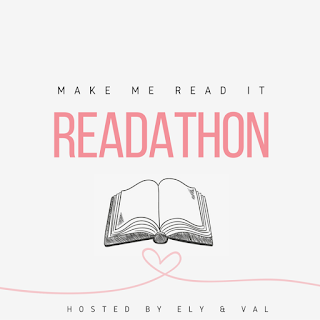 The Make Me Read It Readathon will start at July 9th and end at July 16th. You can start once it hits 12am in your time zone. The readathon itself lasts for a week! Since this is an interactive readathon, there is about a month and a half to get some kind of initial post/photo/video/etc. where your readers can vote for which book you read! You can either have a poll, or just rely on the comments, have votes count more than once, honestly this is all up to you! If you plan to participate, make sure you have all your books ready for July 9th! The Raven Boys and Since You've Been Gone! I've read both and each was incredible in its own way. I've heard great things about both, so I'm looking forward to reading them. I'll go vote right now! Thank you! And I look forward to reading it. I have been debating if I should join this read-a-thon. It looks like fun. I hope you enjoy the books that get the most votes. They all sound interesting either way. If you have the time, you should totally join! I voted for The Raven Boys, since I read it for the first time this week and enjoyed it. I hope enjoy it too! Good luck with this! I suggest Since You've Been Gone (because I ended up liking it a lot more than I expected) and More Happy Than Not (because I'm curious about it and would love to see your toughts). Haha I have high hopes! Hahaha yes I definitely voted for The Raven Boys, but I also LOVED Made You Up! So I voted for that one as well!! Haha seems like everyone is voting for The Raven Boys. I can't wait to read and thank you so much for hosting! I just posted my sign up post as well! November 9 is also on my list but I had to vote for Since You've Been Gone. I absolutely love that book! Good luck with the readathon! I'll have to go check out your signup! Good luck to you too. I've voted for Made You Up and Raven Boys! Here's my Make Me Read It Readathon! Thank you for voting! I'll definitely go vote on yours. Looks like you have lots of good reads to choose from. I hope you enjoy them! I had to vote for Raven Boys, Maggie is one of my fave authors! Here's mine to vote on!